“Where should I retire?” This is the question that we often hear people ask. The obvious answer is not always the place that we already live in. Also, being a retiree with savings and several sources of income could give you an extra advantage: You can live your retirement in more than one place. Study carefully all those factors, and compare them with other options. The best decision is usually an informed decision. Costa Rica is a popular, safe, low-stress place for tourists and U.S. expats. Costa Rica has been known for its stable democracy in a region that has had some instability and for its highly educated workforce, most of whom speak English. A retired couple can live comfortably on $2,500 a month in Costa Rica. And expats can qualify as residents if they have at least $1,000 a month in income from Social Security, a pension or a similar source per couple. In Mexico, International Living says, a couple can live on $1,500 to $3,000 a month depending on location. The budget includes rent and health care. Here the report says you can often live well on $1,500 a month if you choose a place other than the capital, Panama City. Health care typically costs 40 to 75% less than in the United States. Also in Panama, you don’t pay income tax on your overseas earnings. A family of four can live on about $1,200 a month, not including rent. Very affordable, no doubt! In the Cuenca you can rent a one-bedroom apartment right in the city center for approximately $200 a month. In Kuala Lumpur, a couple can live comfortably on $1,500 a month. For $700 a month you can rent a 2,195 square-foot, four-bedroom, two-bathroom apartment in Penang. The healthcare costs are also very inferior to those in the US. Colombia has a total cost of living, for a couple of $2,000 a month. 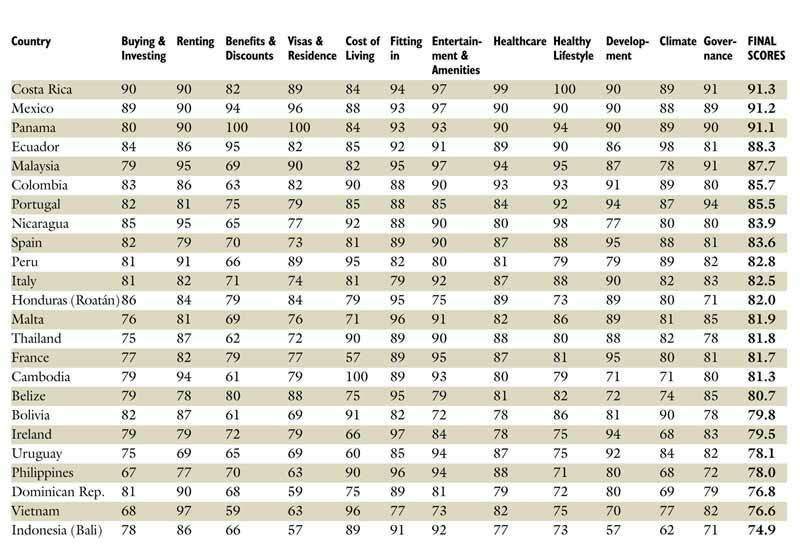 In terms of healthcare, the World Health Organization ranked it No. 22 out of 191 for the quality of care, ahead of the United States and Canada. The report says a couple can pay $1,000 a month for a four-bedroom, four-bathroom home, half an hour from Lisbon. Here I must warn you: In Portugal Real Estate / Renting prices have increased dramatically in the last year. And continue to grow. So I would say that this value for a four-bedroom, today is very difficult to find. A couple renting in Nicaragua and eating out a few times a week can easily live well on $1,500 a month. The cost of living in many of Spain’s midsized coastal cities is for a couple (including rent and private health insurance) around $2,100 a month. In Peru, you can find two-bedroom apartments to rent for as low as $250 per month and couples report monthly expenses of less than $1,000. What's Your Favorite Country to Retire? What about Bali? It has been voted 2 years in a row as Trip Advisor’s #1 best destination in the world. There must be good reasons behind that, so I did a research on google. I found out, with only $130,000 we can own (not rent but OWN) an apartment. Living expenses is quite low, as low as $800 for 2 people per month! With that money, where can you live in North America? With the money I save towards the retirement fund, i have to be smart enough not to flush the whole money in one place. I think Bali is the best spot that checks all the boxes I had for retirement. Warm, affordable, friendly people, and the best hub to other asian countries, such as Thailand, Singapore, etc and also Australia! I am still searching for the best options, but it seems clear to me that Bali will come out as the winner. I think at the end of my research, this will be the place that I am preparing myself to end up with: http://www.thebalivillages.com, I have been in contact with the developer and this place is legit.